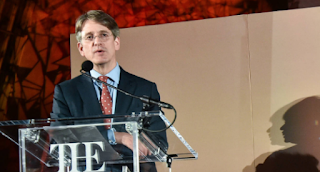 The director and chief executive of the Metropolitan Museum of Art stepped down Tuesday amid roiling concerns about the New York museum’s financial woes. Thomas P. Campbell, a 54-year-old tapestry expert, told trustees that he plans to resign June 30 after an eight-year run that saw attendance, and costs, soar at the museum. Mr. Campbell launched a series of ambitious plans—from digitizing the Met’s vast collection to opening a nearby outpost for its modern-art holdings. Yet cost overruns eventually caught up with the institution, which faced a $15 million deficit last year. In the fiscal year when Mr. Campbell took the helm, the Met posted a deficit of $8.4 million. The museum said Mr. Campbell’s departure was his decision, but it wasn’t entirely surprising. Last spring, the museum embarked on a two-year financial restructuring to winnow spending. Since then, the Met has laid off dozens of staff members, trimmed its exhibition programs and indefinitely postponed a planned $600 million new wing for modern and contemporary art. Chairman Daniel Brodsky said the museum’s president, Daniel Weiss, had agreed to serve as interim chief executive. 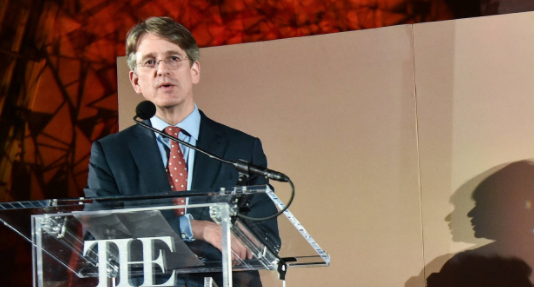 Mr. Weiss, 59, is a medieval-art expert and a former president of Haverford College, who joined the Met in March 2015 and was tasked with getting the museum’s finances in order. Mr. Campbell was once considered a lifer at the museum, which he joined in 1996 as an assistant curator. He had a reputation for organizing popular exhibitions in an often-overlooked area: tapestries. His ascendance to director surprised some, and his lack of management experience was noted when he was hired to succeed Philippe de Montebello, who ran the museum for three decades before retiring. Many of Mr. Campbell’s feats have been hailed, including opening the Met Breuer in the former home of the Whitney Museum of American Art, and overhauling the main museum’s American and Islamic wings. But other efforts were lavishly rolled out, only to be scaled back, like a marketing plan that hinged on a much-ridiculed redesigned red logo. 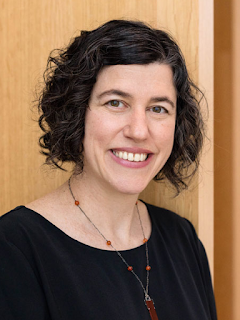 after an extensive, international search, Sarah Guernsey has been appointed to the new position of Deputy Director for Curatorial Affairs at the Art Institute of Chicago. Guernsey, who most recently served with distinction as the museum’s Vice President for Publishing and Design, now oversees the Art Institute’s initiatives within Academic Engagement, Conservation, Design, Digital Experience, Exhibitions and Registration, Publishing, and the Ryerson and Burnham Libraries. Since joining the Art Institute of Chicago in 2009, Guernsey has been instrumental in shaping the museum’s internationally esteemed and award-winning publishing program through her collaborative work with curators, scholars, and artists and her innovative approach to both printed and groundbreaking digital scholarly catalogues. Throughout her career, Guernsey has led efforts to respond to an increasingly complex publishing environment in which digital delivery, advanced imaging technology, and design excellence drive institutional aspirations and expand the museum’s reach to wider audiences. In 2016, she chaired the National Museum Publishing Seminar, the only program of its type in the world to bring together publishing professionals who define best practices for interpreting museum collections and exhibitions through an ever-expanding array of media. Guernsey earned her Bachelor of Arts with high honors from Marquette University and her Master of Arts in Art History, Theory, and Criticism from the School of the Art Institute of Chicago.